When I was way younger I met Carmen online and took her out on a date. I didn't feel a spark and so I tried to let her down gently. She wrote back panicked. "No way. I am NOT gonna lose you. Just tell me what you want me to be and I'll be it." I replied, "I don't want you to be anything aside from yourself. I just think we'd be better off as friends." She wrote back, "That's not an answer. What about me wasn't good enough?" I responded, "Nothing. Good luck out there." I intended for that to be my final word on the matter. She wrote back, "Good luck? GOOD LUCK???" and that was it. A few days later, she emailed me a message with a full-body photo of herself attached. In it, she wore nothing but a smile and a long black t-shirt with one of my profile photos screen-printed on it. The message read, "I had five printed up for each day of the week. Bulk discount. ;) "
I filtered her messages to be auto-deleted from then on. Still, that wouldn't change the fact that somewhere out there, on any given day, a girl is wearing a t-shirt with my photo on it. I love this story! Just think what else she could have put your photo on! Online dating. It does that to self-confidence. 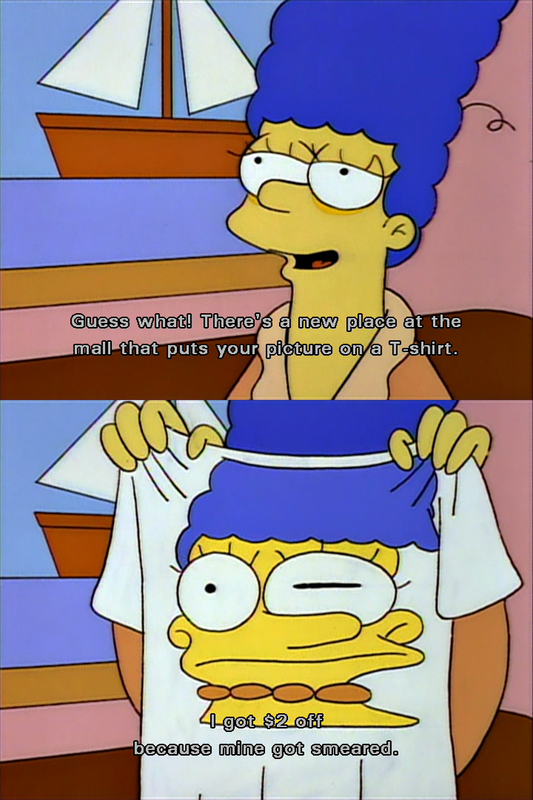 Come on, OP, you've got to give it up for those discount T-shirts.